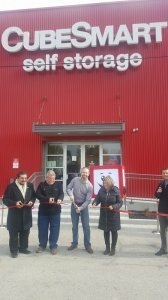 Recently, the Town of Cicero welcomed CubeSmart Storage to its ever-changing landscape during a ribbon-cutting ceremony on Thursday, Nov. 9th. 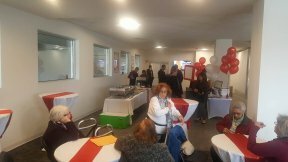 Representatives of the Town of Cicero, fellow entrepreneurs, and residents all welcomed CubeSmart Storage, 1331 S. 55th Ct., Cicero, IL, to the community with open arms. 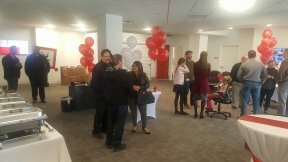 “The response we have received from the people of Cicero has been tremendous,” said Owner of CubeSmart Storage John Dugan. 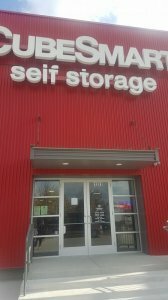 “This project took a few years, but I am happy that we are able to contribute to the business sector of Cicero and we look forward to having a fruitful relationship with the people of Cicero.” CubeSmart delivers personal self-storage solutions at more than 900+ locations nationwide, now including Cicero, IL. CubeSmart offers immediate need for a convenient, clean, and affordable place to store your belongings. “It is always amazing when we have new businesses coming to Cicero because that brings new jobs and more economic development,” said Frank Aguilar, a representative of the Town of Cicero. “We are excited to have CubeSmart Storage and we look forward to working with them in the future.” CubeSmart’s mission is to simplify the organizational and logistical challenges created by a hectic lifestyle. CubeSmart Storage was established in 2004 and promises to be Cicero’s most trusted names in storage.